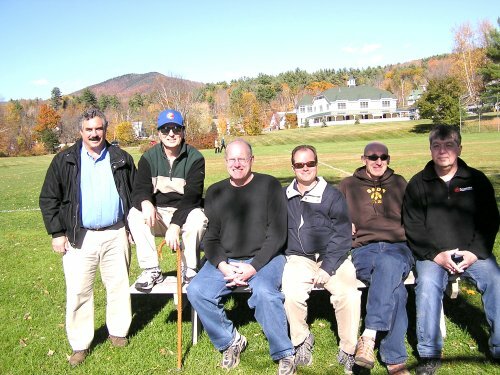 I can't resist holding my annual disciple retreat up in the beautiful White Mountains of New Hampshire in mid to late October - sometime after Columbus Day. That is when the leaves are at or just past their peak and all the crowds are gone but the beauty of Nature still radiates from everywhere, the air is crisp and fresh, and there is little to distract us from the difficult tasks we are there to work through. 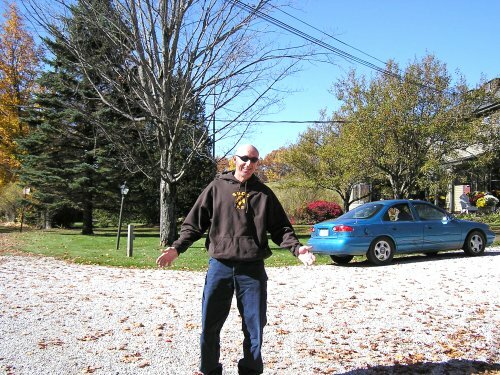 I took my disciples up the weekend of October 13th through the 15th. Perfect! Left to right - 2nd Degree Black Belt Nidan Scott Williams of the Red Leaf Karate Club, North Berwick, ME, myself, 3rd Degree Black Belt Sandan James Nancarrow of the Northwood School of Self Defense, Northwood, NH, 3rd Degree Black Belt Sandan Tim House of the Tai Chien Dojo, Portsmouth, NH, 4th Degree Black Belt Yondan Russ Jones of the Sachem Self Defense School, Laconia, NH, and 2nd Degree Black Belt Nidan Rick Downs from the Rose School of Karate. Of course, we have fun too! 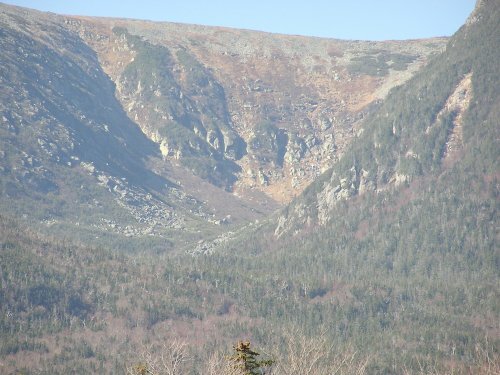 Walks in the woods, or along cold mountain streams, or hiking part way up the side of the mountain at one of the ski resorts. 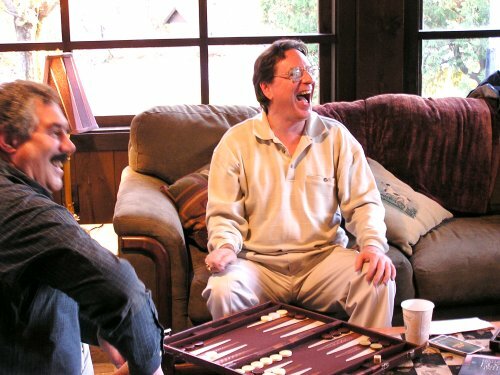 There are spirited backgammon games in the late afternoon when we get back from a busy day of work in the inn's lounge where hot apple cider, cookies, and cheese and crackers await us. And we go out of our way to dine in style each night. 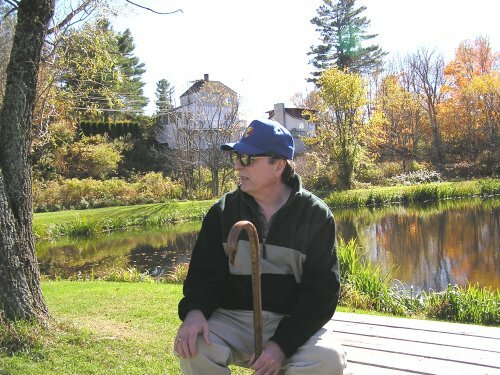 As most of my disciples are studying the cane under me since I am a certified black belt in CaneMasters International, we spent some time going over striking theory and work on the form "Old Man With A Cane". And there was some discussion on advanced forms and how those techniques can be extrapolated to real world functionality which I hope everyone found interesting. So much to do that it's tough to pull out and head for breakfast, though seeing your breath in cool air reminds you of the warm pot of coffee waiting in the dining room! Each year I try to have two or three prepared topics or presentations that I want to give but this year my focus was on one major philosophical issue that I wanted to make sure everyone had a firm understanding of how to apply in their daily physical lives. My hope is that everyone came away with a deeper understanding of this topic and will reflect upon this through the course of the year and bring the topic up periodically either with me personally or through cassette tape correspondance which many do with me. 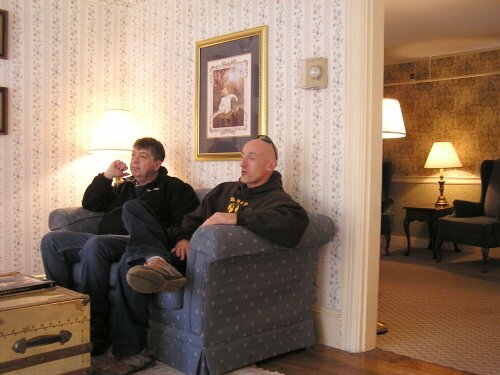 I'd like to thank Richard of the Whitney's Inn for another memorable and enjoyable stay and for not only the terrific atmosphere in the lounge for us to relax in each afternoon, but also the great dinner we had there Saturday night. Also thanks go out once again to Charles Maller of the 1785 Inn and our waiter Allen for the sixth or eighth year running I think for a great dinner there. 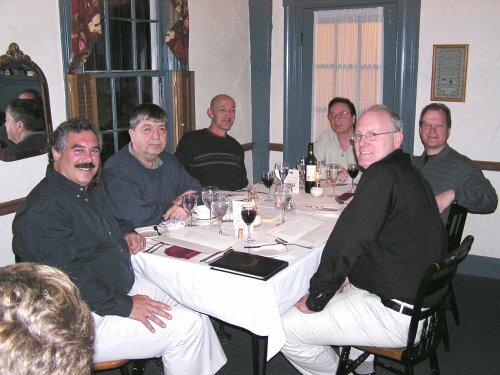 I think there would be a revolt of the troops if we didn't have one dinner at the 1785 - a tradition that goes back over twenty years; probably longer! 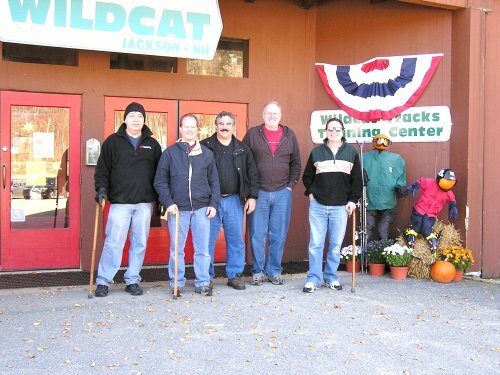 Missing from this year's retreat due to work and family issues were Storm Dragon Grandmaster David Landers of the Storm Dragon Dojos, Effingham, IL, Sandan Carl Parker of the Lone Pine Martial Arts Academy, Spokane, WA, and Nidan Charles Arlington from the Rose School of Karate. 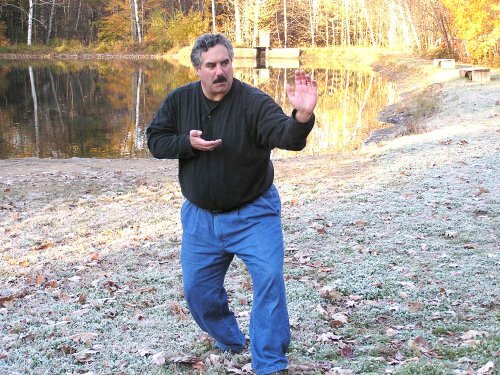 We are hoping to see all those folks, as well as disciples from all of the other lines, at the 2007 All C&S Self Defense Association Grandmaster's Retreat out in the Mid-west this coming Spring. Nidan Scott Williams and Nidan Rick Downs in front of my condo leaving Friday morning for the retreat. 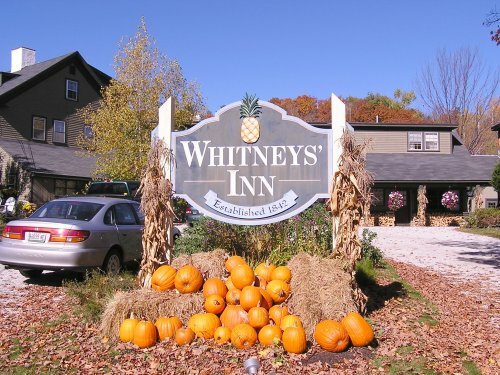 The Whitney's Inn entrance is always tastefully decorated. Yondan Russ Jones arrives and is now "... in t'house"! 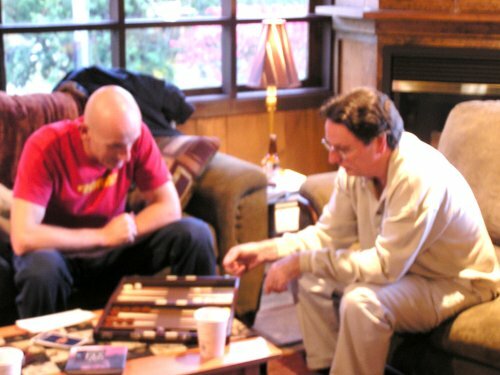 Nidan Rick Downs and Yondan Russ Jones relaxing in the common area living room of the Whitney's Inn on Friday morning as we get ready to begin our retreat. Down by the pond and soccer fields in Jackson addressing a topic for the group. Notice I have Janis at hand - I kept her close for the whole retreat, as did others with their canes. When you study a weapon, you must live with it and use it and absorb its very essence. 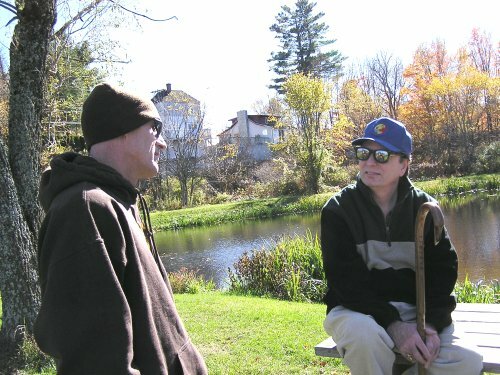 Nidan Rick Downs and Sandan James Nancarrow listening in on the discussions in the park. Yondan Russ Jones and me in the park. A great shot of the whole group that Sandan Tim House grabbed a passer-by to take this picture. From left to right - 2nd Degree Black Belt Nidan Scott Williams of the Red Leaf Karate Club, North Berwick, ME, myself, 3rd Degree Black Belt Sandan James Nancarrow of the Northwood School of Self Defense, Northwood, NH, 3rd Degree Black Belt Sandan Tim House of the Tai Chien Dojo, Portsmouth, NH, 4th Degree Black Belt Yondan Russ Jones of the Sachem Self Defense School, Laconia, NH, and 2nd Degree Black Belt Nidan Rick Downs from the Rose School of Karate. 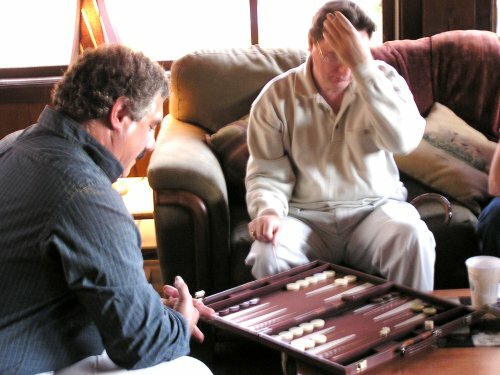 Nidan Rick Downs, Yondan Russ Jones, Nidan Scott Williams, and Sandan James Nancarrow relaxing over some backgammon in the lounge after a long day of work. Nidan Scott Williams and me working through some positions. Somebody had just made a wise-assed comment about my fists of fire and so called lucky throws. 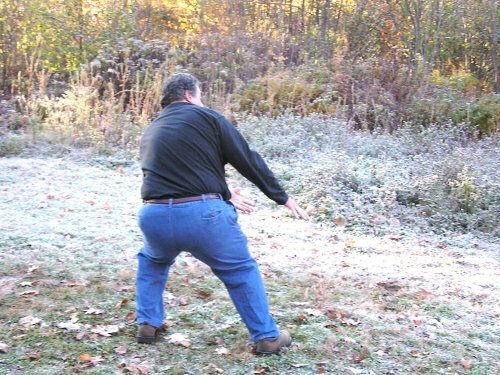 They just don't understand that I throw with the force of all Nature behind me... Hummmm, and I haven't even had a glass of wine yet! Yondan Russ Jones is about to experience some action from my fists of fire here I think... But he doesn't even know it yet. Dinner Friday night at the 1785 Inn. Thanks to Allen for taking out picture! 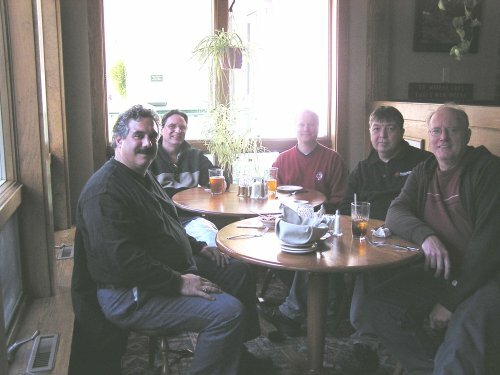 From left to right: Nidan Scott Williams, Nidan Rick Downs, Yondan Russ Jones, myself, Sandan Tim House, and Sandan James Nancarrow. Nidan Rick Downs and Sandan James Nancarrow being run through some forms early Saturday morning by a very cold appearing Yondan Russ Jones. Sandan Tim House in one of the opening moves of the Rose Crane Spreading Wings At The Break of Dawn Set. 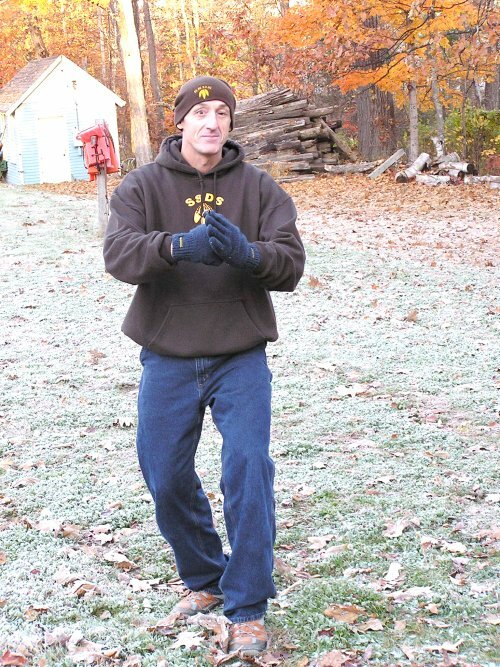 Nidan Scott Williams running forms and harmonizing with the Nature around him; totally focused and committed. That's the way you do forms! Nidan Scott Williams in a move from the Bai Sai form on some rough and slopping terrain. 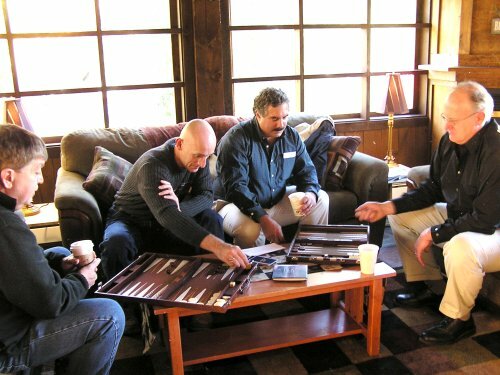 Here I am leading a clinic on cane basics application theory for the group. 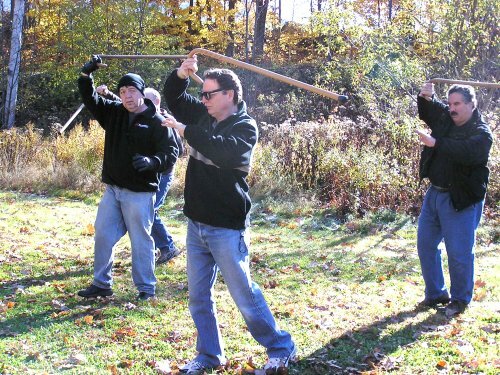 Here I am teaching some theory for the Clearing Strike with the cane. 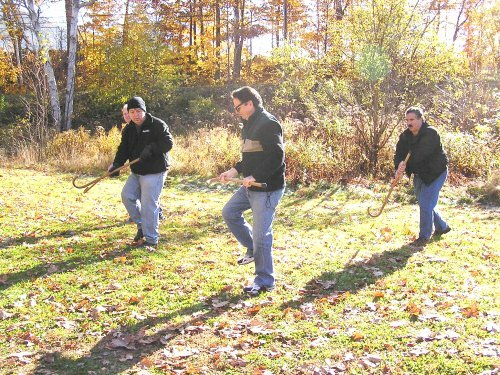 Running through some of the movements of the cane form. 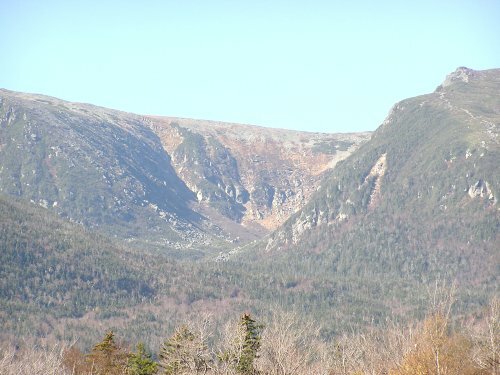 A shot across the valley from where we were up the side of Wildcat Mountain over at Tuckerman's Ravine. Sandan Tim House asked a passer-by to snap this picture of us in front of the Wildcat Mountain Ski Area. 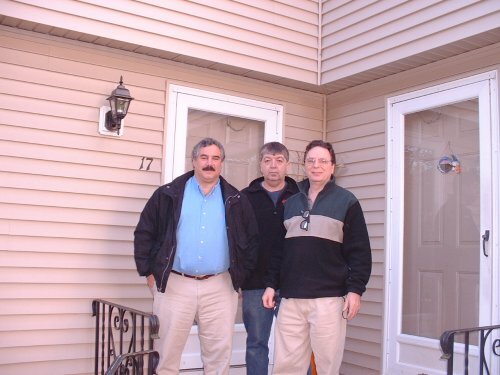 Missing is Yondan Russ Jones who had to leave early Saturday morning to attend a funeral for a close family friend. Out on the deck at Wildcat continuing the discussion of the current topic I had proposed to the group when we were hiking around the base of the mountain. 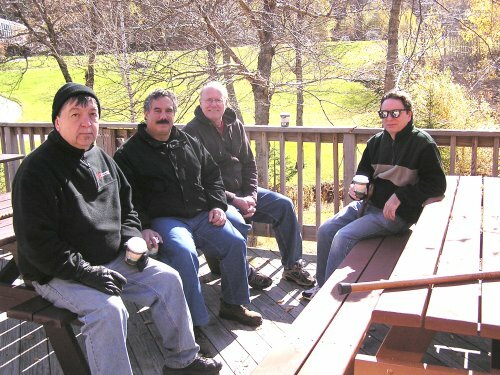 It got a little chilly up high so we opted to come back down, get some hot coffee, and sit out on the deck in the sun. 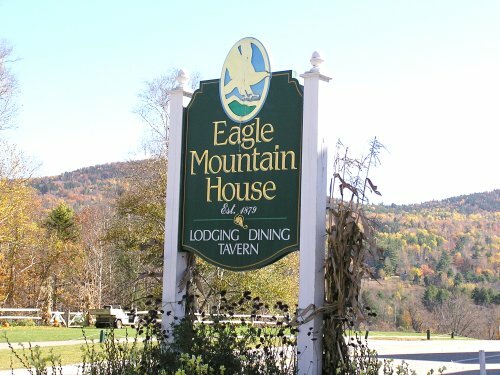 We stopped at The Eagle Mountain House for lunch on Saturday. Having lunch in the lounge at The Eagle Mountain House. 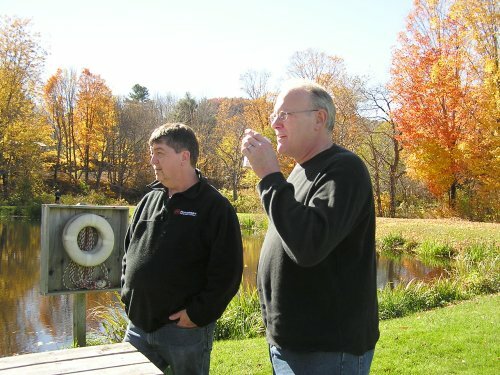 After we finished, we went out onto the large wrap around veranda of the hotel and sat in the great Adirondack chairs there just looking out over the valley. The weather was considerably better than the previous year we were here where it was raining heavily. While everyone enjoyed each other's company sipping hot apple cider from the lounge, I met individually with each disciple in the hotel's main salon so that specific issues and needs could be discussed. It was a wonderful time to share thoughts and plans with each disciple.